I turned around to find my mom, to try to catch her whispering our names to some off-stage person. She was nowhere to be found. I looked for a slip of paper, a whispering assistant or some other means of getting that information to this bearded guy. Nothing. My pre-teen confidence was shattered. What if I was wrong – what if there was a Santa after all? I remembered back to the previous year. I had asked for a Little Kiddles playhouse. It was obvious from our pre-present-opening spyfest that my sisters were getting one, but none was to be found for me. Dejected, I went out with the family on our “get out of the house so Santa can deliver the gifts” walk. And upon returning, lo and behold, there was my playhouse, from Santa. Or a few years before, when out on the aforementioned walk, that we had “seen” something on a roof and saw reindeer tracks in the snow. Hmmmm. Maybe there was something here to believe in. 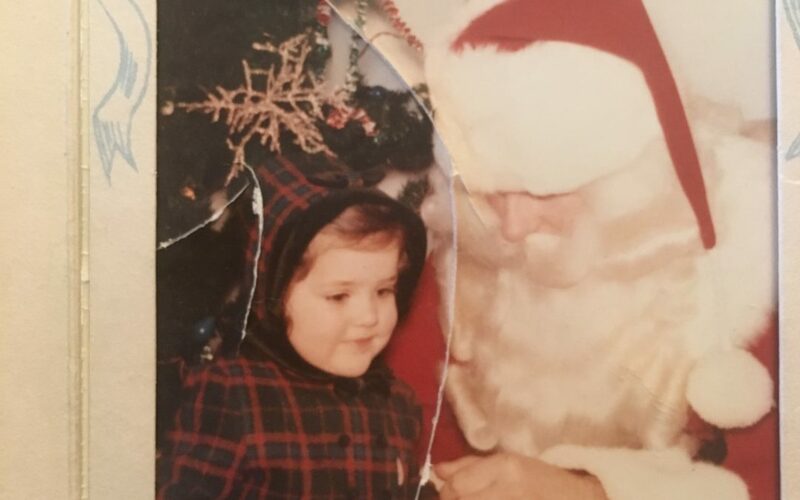 It was then that I decided I would believe in Santa forever. Maybe not the literal guy, but the spirit. The concept that when you believe in something, miracles can happen. Fast forward a few decades to today. I am still a Santa believer. I love the concept of something that instills hope, honors goodness, and recognizes the child in all of us. I truly believe that when you hold the space, a miracle can occur. And while Santa may be the “human” form of goodness and love, I am beyond grateful for a new, nearly daily reminder that love abounds. For those of you who know me, my proof positive of this are the hearts I see – everywhere. I believe that I am being watched over by those on “the other side” and whenever I need a boost, a reminder that I am loved, or a confirmation that I am on the right path, I find a heart. It’s not surprising to me as I do believe that love abounds and is there for us- when we are open to it. The Santa theme, taken to a new level. I may not be finding reindeer tracks this year, or holding my breath as to whether my favorite toy will magically appear under my tree. Heck, I don’t even have a chimney anymore! But I still believe. And as long as I believe, I know I will receive all that I need. And probably more. May the spirit of Santa live in all of us today and into the new year. And may you find a few reminders on your path today!